The special limited edition catalogue and jigsaw set is now available, and it is released to accompany Slinkachu’s new solo exhibition Miniaturesque. Slinkachu has this time chosen the humble medium of the jigsaw for the deluxe edition. Once so common in every living room, it perfectly embodies the theme of nostalgia and fun for all*. The catalogue is signed & numbered, it contains all the printed editions available in the exhibition. 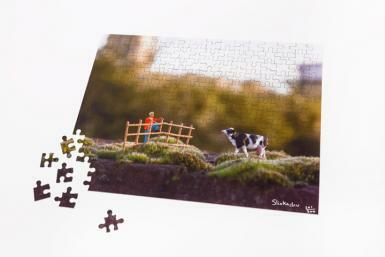 The accompanying signed and numbered jigsaw depicts God’s Green Earth, a work featured in the exhibition that you can actually put together yourself [instructions not included]! The deluxe edition box set comes in an edition of 300 and measures 25 x 33 x 4 cm.